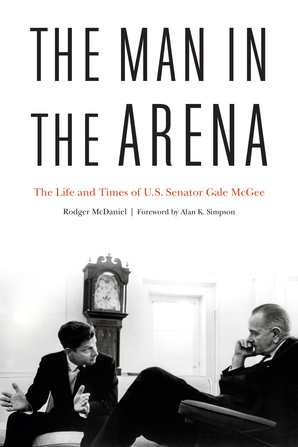 At long last, Wyoming Senator Gale McGee has a sterling biography of his own, written by Rodger McDaniel, a former Wyoming state senator who served with McGee and has previously written a biography of Wyoming Senator Lester Hunt. The Man in the Arena: The Life and Times of U.S. Senator Gale McGee arrives from Potomac Books, an imprint of the University of Nebraska Press; McGee was born in Nebraska in 1915, and after he received his Ph. D from the University of Chicago, he accepted a position as a professor of American history at the University of Wyoming, where he served for years as one of the most popular and engaging professors on campus. It was a settled and satisfying position, a berth where another person might have been perfectly comfortable remaining for the rest of their life. But McGee decided to enter public service, and in 1958 his candidacy received one of the most resplendent cascade of blessings then imaginable in US politics. Lyndon Johnson, John F. Kennedy, and Harry Truman all stumped for him; Eleanor Roosevelt helped with his fundraising; he beat the incumbent by a sliver and went to Washington, where shortly he returned the favor, tipping Wyoming’s delegation in favor of Kennedy at the 1960 Democratic Convention. McCree went on to serve five presidents during three terms and a tour as ambassador to the Organization of American States under President Carter. McGee and his colleagues did their jobs well, conducting the public’s business during some of the most turbulent times in U.S. history. Today many Americans wish for a more civil dialogue in the public square. They long for respectful and honest debates over difficult issues. They say they are tired of negative campaigns and television and radio news shows where the hosts and guests talk past one another in echo chambers. Gale McGee was an upbeat, upright, dedicated public servant of a type today’s news pundits assure their listeners on a daily basis no longer exists, and as a long-time teacher of history, he would have politely scorned a work of mere hagiography. His biographer knows this and wisely avoids producing such a book. The results are appealing enough without the halo in any case.